In the world there are three wolf species: The Gray wolf, Red wolf and Ethiopian wolf. There are also several subspecies that are named based upon the region where they happen to be found. While there are plenty of similarities about these types of wolves there are also enough differences to separate them. The more research that is done the more those distinct differences are seen. 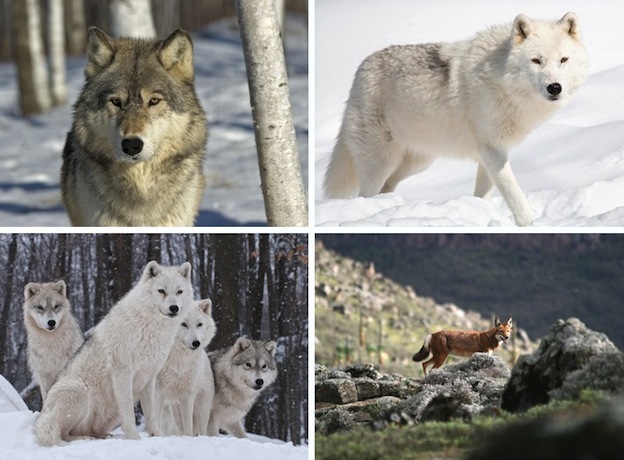 The Gray Wolf is the one most people are familiar with. They can be all colors and range in size depending on where they happen to reside. They can be found throughout the United States, Canada, and into Alaska. They also inhabit some regions of Europe, Asia and Africa. Overall they are still considered an endangered species. However, in areas of the United States they have reach high populations so controlled hunting of them is allowed. The Red Wolf gets its name from the coloring of it. They have a reddish tint to their fur that sometimes results in them being confused with the fox. They can also be brown which is why they are often believed to be a different species of wolf when they are seen in the wild. They are mainly found around the areas of North Carolina and South Carolina in the United States. They are considered to be an critically endangered species and have been so since 1996. The Arctic Wolf is one that definitely gets attention due to the white and yellow coloring of it. They live in the coldest region of the Arctic where very few other animals are able to survive. As a result they have a very large rang to explore. Even so, it can still be very hard for them to find enough food for survival. Due to global warming and other factors this particular wolf has had its own share of struggles. There are about 3,000 Indian Wolves left in the wild. They are found in remote locations including Uttar Pradesh and Haryana around the areas of India. It is in grave danger of extinction as it is heavily hunted. In many areas of India the people are very poor. What livestock they do have they don’t want to see killed by these wolves. They also hunt them as a source of meat for their own survival. The Indian Wolves continue to have their own territory taken, making it more common for them to come into the areas where people live. The Himalayan Wolf resides around remote areas that includes five countries: Bhutan, India, Nepal, China, and Pakistan. It is believed they separated from other wolves long ago through an evolution process due to the glaciers being in place. They do have some territory that overlaps with the Indian Wolves. However, there is no evidence that they form packs together or of breeding between the two species. The Ethiopian Wolf is found in areas of Africa. They are very closely related to the Gray Wolf. This is a very small type of wolf and it is often mistaken for a coyote due to that fact. They do live in packs but are often seen venturing out on their own for hunting of small prey. They don’t seem to have the same need for the complex social structure as other wolf species. If you are interested in any of the different wolf species it can be fun and very interesting to learn more about them. You will find plenty of documentaries, books, and other resources about them online, in bookstores, and even at your local library. The fact that many species of wolves are endangered means that you may want to take part in efforts to keep them around.